Turkey’s biggest city has got a lot going for it. Stunning architecture, friendly faces and more than enough to keep you going for a long weekend. 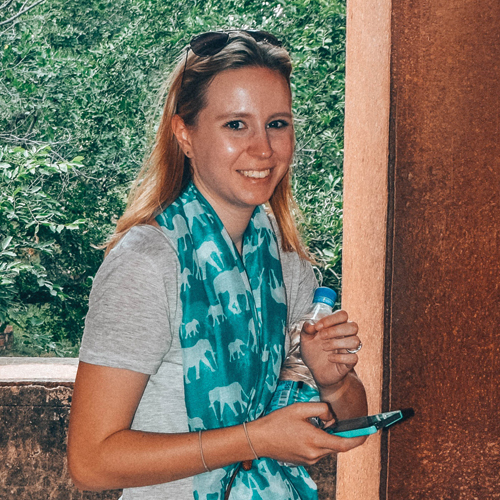 Let me share my advice on how to spend 48 hours in Istanbul. After a quick three and a half hour hop over Europe from London, I arrived in Istanbul on a fabulously sunny Friday morning. I was excited (if a little trepidatious) as to what I might see and the people I might meet (the Turkish referendum was happening the very weekend we were there!) but as usual, I had nothing to worry about. People seem to absolutely adore this place, so I knew that I’d have my work cut out to do it all in 48 hours. 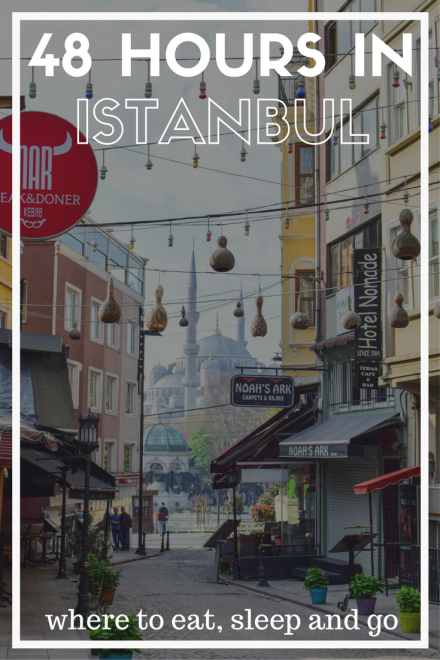 This post gives you my recommendations on how to make the most of your short trip to Istanbul. Istanbul is famed for being the only city in the world that straddles two continents. Because of that, there’s a hell of a lot to see and a lot of ground to cover. 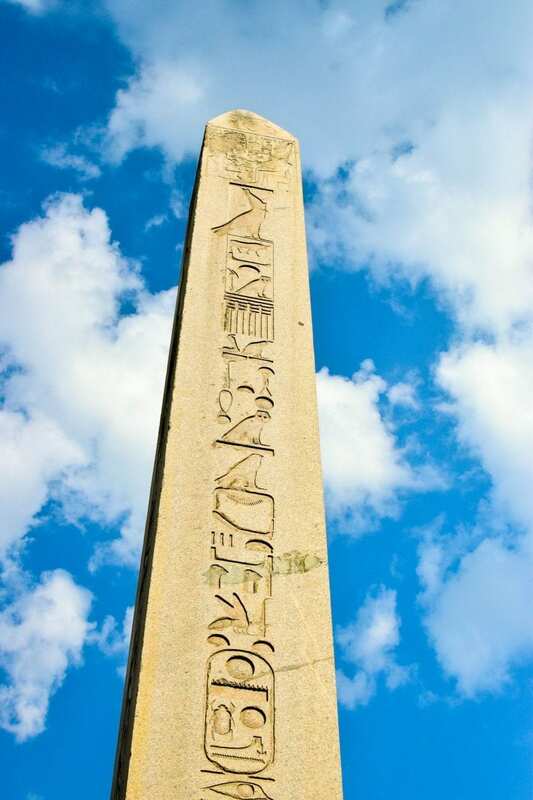 For that reason, we chose to do a full day walking tour with Daily Istanbul Tours. 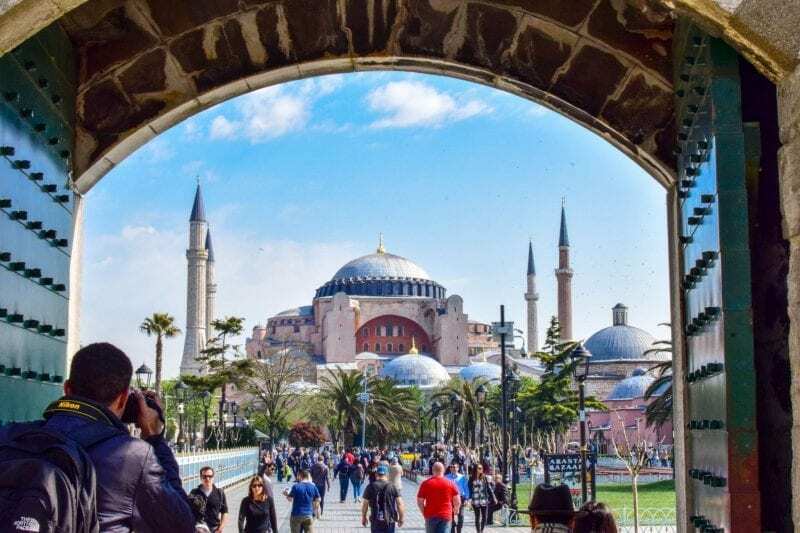 It allowed us to take on all the main sights in the old town including the Hippodrome, Blue Mosque, Hagia Sophia, Grand Bazaar and Topkapi Palace. They’re all fascinating places with incredible histories that we just wouldn’t have known without a guide. As part of the tour, you have free time at each place to explore and take photos. The tour also includes a hearty lunch and entrance to each place. Even though it might seem expensive, it’s really worth it. Our guide, Oz, was fantastic. She clearly loves her city and that comes across in the anecdotes she would tell us over lunch and while walking between sights. Her knowledge of the history was unquestionable and she was honest enough to say she didn’t quite believe that is really Moses’ 3000 year old staff behind glass in the Topkapi Palace exhibition. Well, you wouldn’t really, would you? While you’re merrily wandering the streets at ground level, you may be completely unaware of the cavernous tunnels that lay beneath you. The best way to see them? 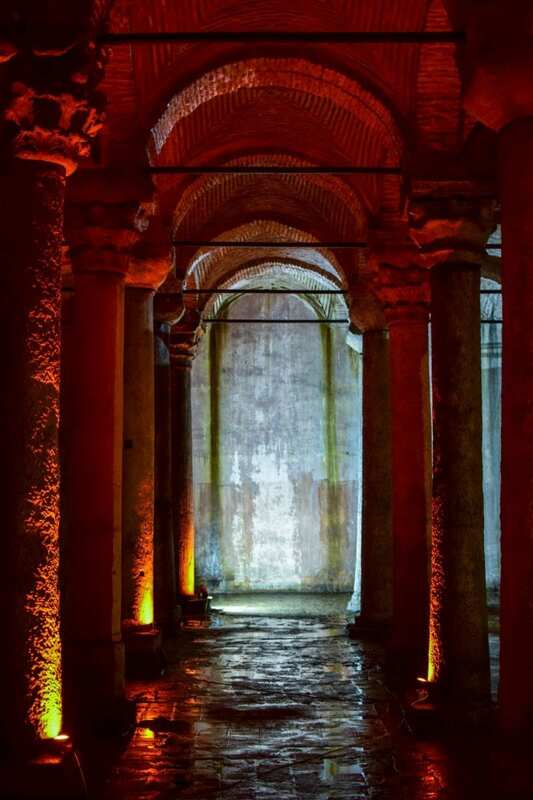 Go underground to the Basilica Cistern – a labyrinth of archways and columns, built in the 6th century to store and provide water to the surrounding buildings. It’s a fun place to explore and try to take non-blurry pictures (good luck with that without a tripod!) 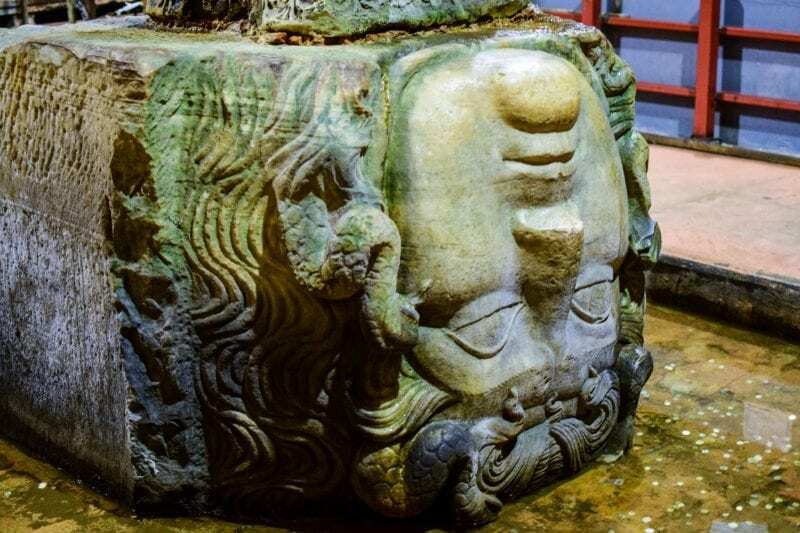 The biggest attraction has to be the two columns with Medusa heads sculpted into the base. No one really knows why they’re there or even why neither is upright, but it’s fun to come up with conspiracy theories of your own. Maybe we all used to live upside down?! One must do that we didn’t do (isn’t that ironic?) was a trip up the Bosphorus. It’s a body of water that effectively splits Istanbul in half across the two continents. 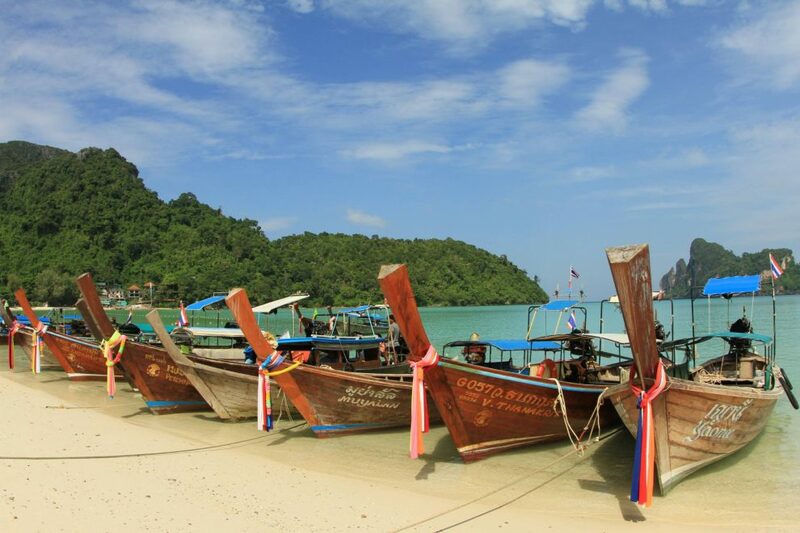 There are loads of tour companies that will take you on a leisurely cruise along the coast of Asia and then back via Europe. Just beware, the whole journey could take you all day if you take the wrong one – not a great way to spend your precious 48 hours in Istanbul! 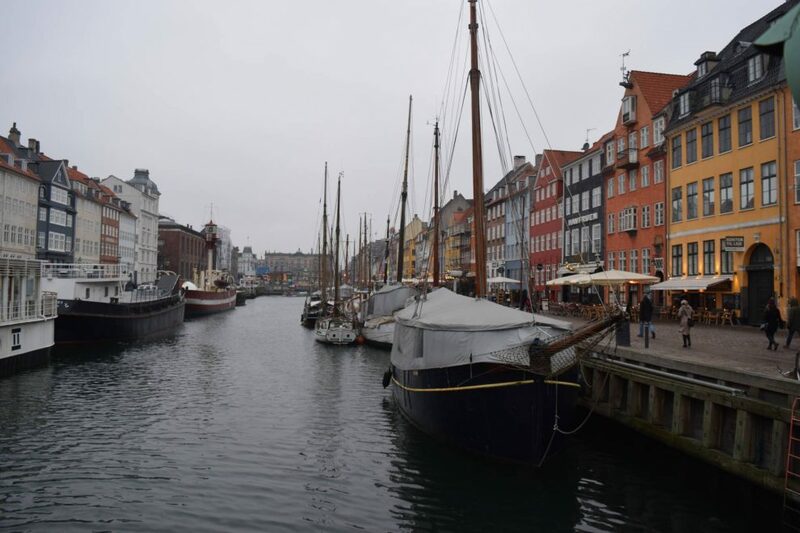 Most visitors tend to choose between the modern town and the old town when looking for somewhere to rest their heads. 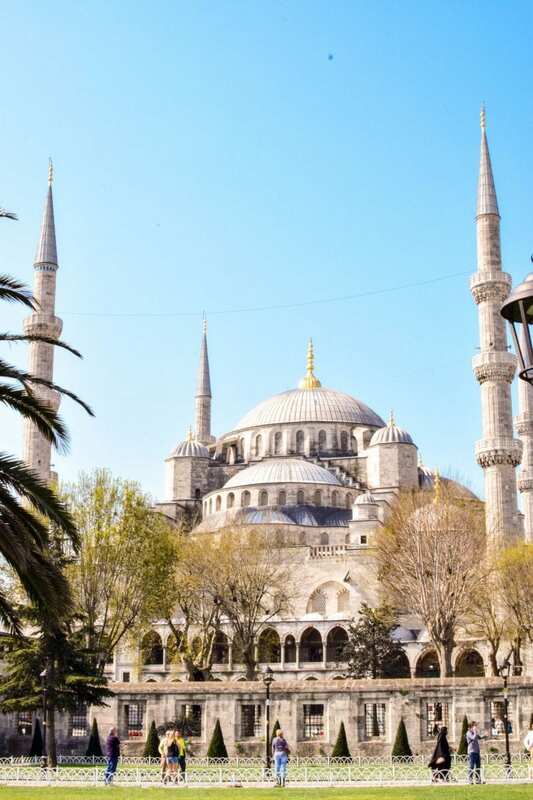 While the modern town is home to Taksim Square – the lively hub of the city – having just 48 hours in Istanbul meant we wanted to be as close to the main sights as possible. We opted for the neighbourhood of Sultanahmet, which was definitely the right decision. Not only could we flop out of bed and into a tourist attraction in the morning, we could also stumble back to bed after one too many rakis at night. We slept in the Sura Design Hotel – a fabulously decorated modern hotel in the heart of the old town. Normally a place like this would be way out of our budget, but visiting in the turbulent times of 2017 meant we could take advantage of Turkey’s drop in tourism and a drop in prices along with it. 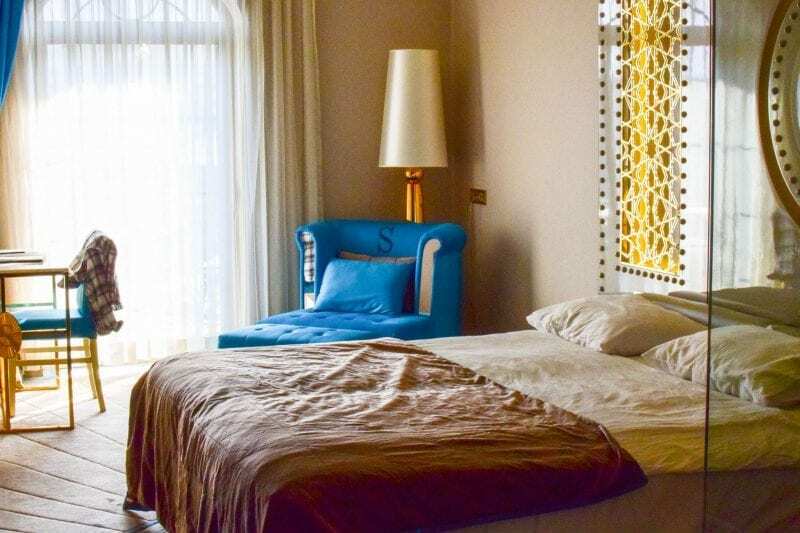 The turquoise and gold rooms are comfortable, spotlessly clean, and smell AMAZING. It even had a little balcony overlooking the landscaped garden and (if you leaned really far over to the right) the blue mosque. Breakfast was the usual selection of English style hot options, and continental cereals, yoghurts, pastries and fruit. If you wanted to be really Turkish, you could try salad, cheese and sickly sweet puddings. We passed. We ended up eating at the Sura Restaurant for dinner one day and lunch the next, completely by accident! The first time, we were wandering along the street looking for somewhere to eat, when a friendly guy standing next to the menu struck up a conversation (they’re good at that). 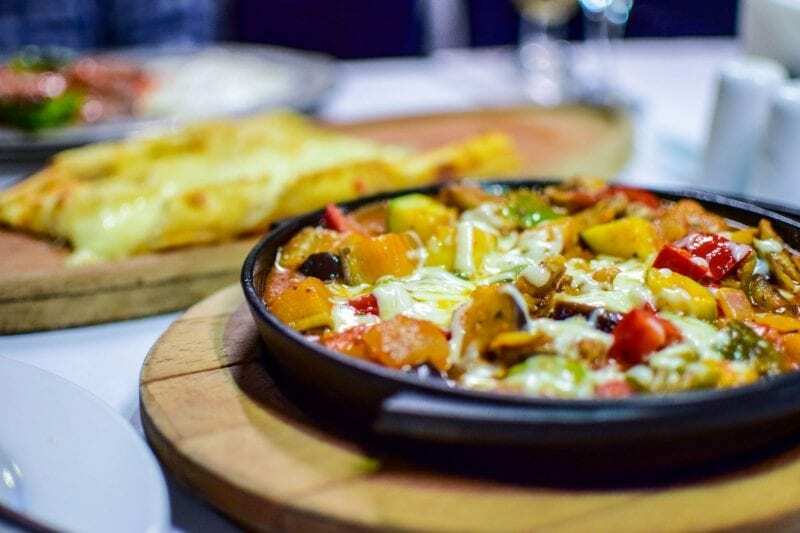 Before we knew it, we were sat inside the restaurant ordering kebabs and vegetable casseroles! It was great food, though, and the big windows looking out onto the street made it ideal for people watching. Also, the 10% discount offered to hotel guests didn’t hurt. The second time, our tour group stopped off for lunch at the same restaurant. Our guide even said it was one of the best places to eat in the old town. Result! Our group had a set menu, so I ended up eating the same thing both times too. I didn’t mind though – I was relieved to find somewhere that meant I wouldn’t be forced to eat a kebab without the meat! I’m usually wary of places where the ‘host’ chases you down the street to look at his menu. But Gulhane Sark Sofrasi surpassed all expectations. We were the only diners for an hour, the stark reality of Turkey’s 85% drop in tourism beginning to hit home. The restaurant host’s keenness makes sense now, doesn’t it? The restaurant is a lovely little family run thing with delicious food and BIG portions. We were treated to an appetiser of ‘balloon bread’ (the most sought after prize in Turkey seems to be how big your bread gets rather than anything else) that we scoffed down with yoghurt and tomato dips, halloumi and hummus. 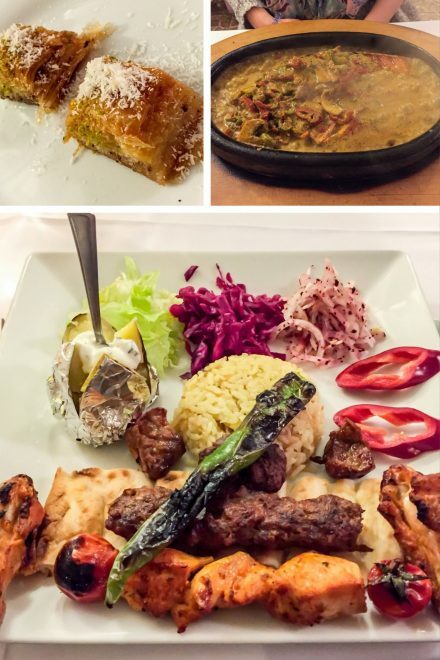 For our main, there was the usual selection of kebabs (not your greasy, hangover style kebabs – the real ones). The waiter seemed very keen for us to peruse the fish menu too. I took the hint and ordered the fish, but was very glad I did. It was a piece of salmon cooked in a very tasty but spicy vegetable sauce, served on a sizzling plate. It was fantastic and so so yummy. They’re clearly feeders at this place. They wouldn’t let us leave without trying their baklava and offering up a glass of raki and water. Raki is a Turkish spirit with a distinct aniseed and liquorice taste. They mix it with water to dilute it, and it turns the whole thing a cloudy white colour. You’ve got to try it – just once – and let me know what you think. If you’ve got 48 hours to spare, you won’t go wrong with a trip to Istanbul. Just three and a half hour flight from London, it’s perfect for a long weekend away. As a melting pot of identities and cultures, you’ll feel like you’ve travelled to more than just one city. Disclaimer: I wasn’t paid to write this post, so you can be sure that everything is my own humble opinion. Everywhere on this list was chosen through my own research. 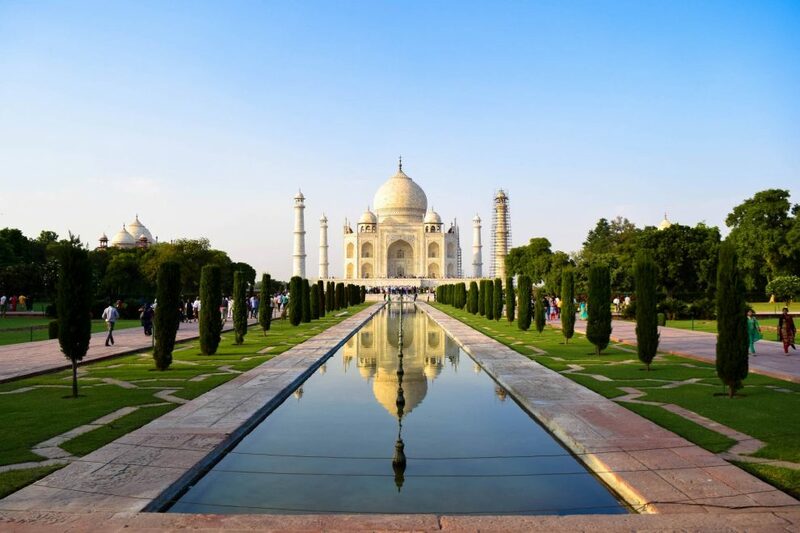 Where is India’s Golden Triangle? Next Post Is Istanbul safe for visitors? Sounds like you absolutely crammed everything in in 48 hours. Definitely want to visit Istanbul at some point and it’s encouraging that you can do it on a weekend break. 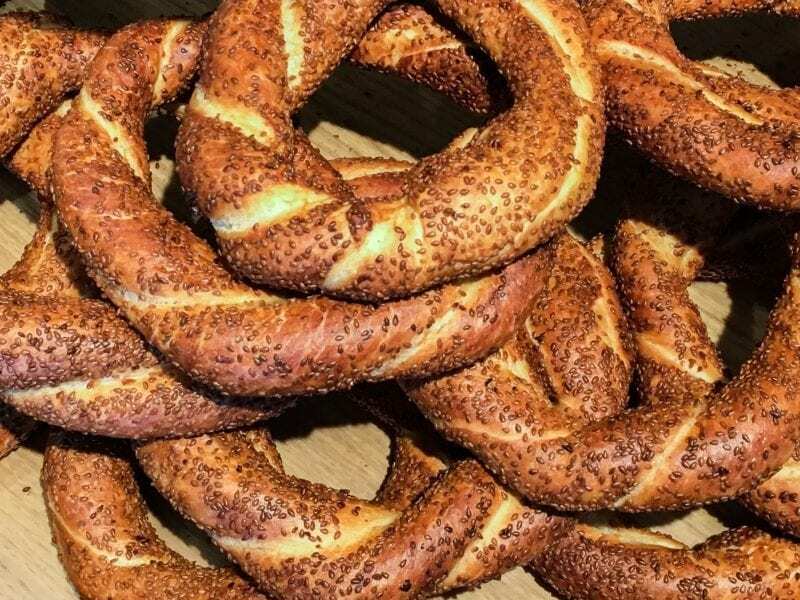 Also, NEED to try simit! Absolutely! I think 48 hours is perfect for a trip to Istanbul as a city. There’s certainly more we could have done though, but I was too busy eating all the yummy food to do some of them! Great info for those who don’t have a lot of time in Istanbul! Thanks! Thanks for your comment! I’m all for making the most of these short trips 🙂 Where’s your favourite place to visit?